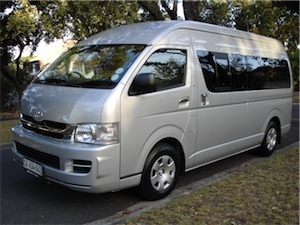 Our vehicle is a brand-new, top-of-the-range Toyota Quantum van. It seats 13 passengers in full luxury, with the following features: individual, reclining seats; air-con and rear passenger climate control; 3-point seatbelts; front-loading CD player with surround sound; and ample leg- and head-room. Complimentary tea- and coffee-making facilities will be provided in the vehicle, as well as a selection of daily newspapers and periodical magazines. Any special requests (such as chilled alcoholic beverages for the trip home) can be forwarded to us, and implemented at a nominal extra cost. To ensure that every one of our passengers is as comfortable as possible, we have decided be take a maximum of 11 passengers on The Lifestyle Shuttle, even though we are equipped and licensed to carry 13. Initially we’ll be operating between the Tableview/Blouberg area and the CBD. If there is enough demand for other routes, we would look to run those as well. The service will pick you up at home (or as close to home as possible – please see our Terms & Conditions) and, once everyone has been collected, head into town, where we will drop you at or near your office. At the agreed upon time at the end of the work day, we will collect you and the other passengers from town, and bring you back home. Don’t deal with the crazy traffic – leave it to our professional drivers. You can relax on the way to work and on the way home. Catch up on some work, read the newspaper, listen to music, have a nap – how you use all this new-found extra time is up to you! You are reducing congestion on our roads. Save a fortune on petrol, and expensive monthly parking. Reduce wear & tear on your own car, saving you even more! You are reducing harmful pollution, and minimizing your carbon footprint. If only a service like this had come along before! So go on, give us a call today on 084-444-5466, or drop us an email on shuttle@chariotgroup.co.za, and treat yourself to a little bit of luxury every day.